Compounding is a process that mixes one or more polymers with additives to make plastic compounds to be used in other plastic processes such as extrusion and injection molding. Mixing, conveying, venting and additive feeding allows the design to be changed to meet the production and product needs. Selection of the components to be mixed (viscosities, additive carriers) is as important as the equipment. 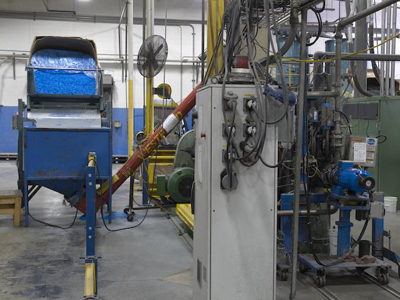 Pro Ex has multiple compounding / pelletizing lines in operation that are capable of processing a wide range of materials including commodity resins, repro, and engineering grade resins. Pro Ex Extrusion utilizes vented extruders with underwater pelletizing systems. In Underwater Pelletizing Systems, the molten polymer emerges from the die holes and is cut into pellets by the rotating blades under controlled temperature water. The cut pellet is immediately quenched and solidified. The water then transports the pellets to a centrifugal dryer where they are dried and discharged to classifier.